In this article, I will show you two ways to fill PDF form according the PDF file form. 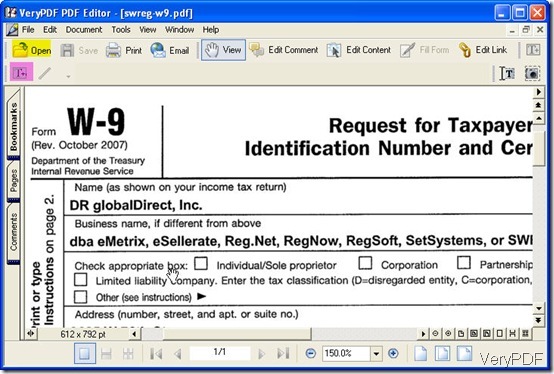 When you fill interactive PDF form, you need to use VeryPDF Form Filler v3.1. But when you need to fill flatten PDF form, you need to use PDF editor. Now let us check them one by one. Method 1- Fill interactive PDF file. 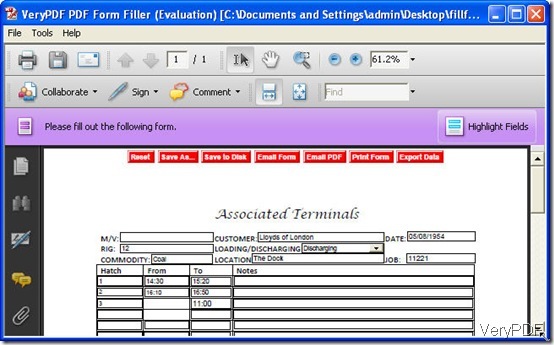 Download VeryPDF Form Filler v3.1. The downloading and trying are free, you can use it free many times. Downloaded successfully, there will be an icon on the desktop, double click it then you can enter its interface. Click the option File on he left corner of its interface then you can add file to it. Now you can fill form according to your needs. If you have prepared the data, you can click the option Tool then go to Import Data. By this way, you can add date from other file to existed PDF form. After fill form, you can let it Flatten in Tool option. By this way, you can make the interactive PDF form to normal PDF file. If you need to send the PDF file to some one after filling, you can click the option Email PDF. You can also Print PDF file by this software directly. After filling, you can set password for the PDF file in two levels from two aspects by clicking the option Tool then go to Document Security. This way is adopt for filling interactive PDF form, but when you need to fill the flatten PDF form, you have to take method 2. Method 2- Fill flatten PDF file. Double click its icon if you download it successfully then you can enter its interface. 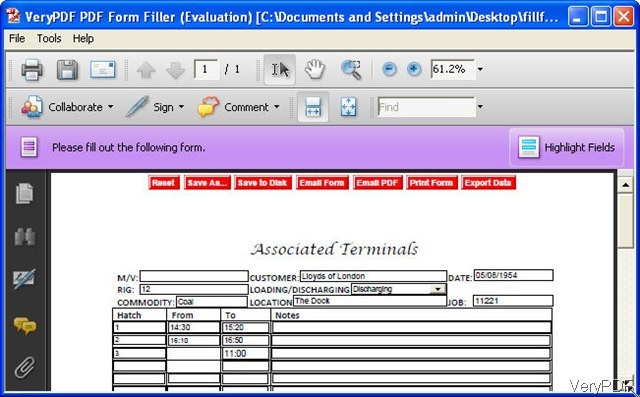 Click option Open then you can add the form needed filling to this software. If you need to fill this form, please click option Edit Content then the option “T+” will go blue. Click it then you can fill form. Edit link. You can add a hyperlink for any part of the characters. After editing, you can email the edited PDF to some one directly. Edit comment for the PDF file. Now you may wonder that “ can PDF Editor fill interactive PDF form?” The answer is NO. 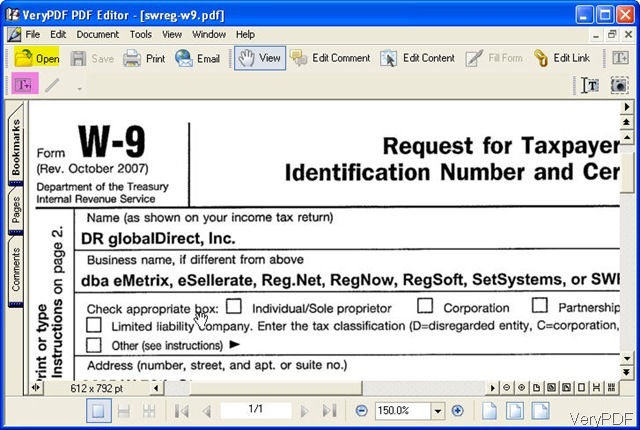 Normally speaking, the interactive PDF form can be filled directly without any software. But by VeryPDF Form Filler , you can have more options to handle the edited PDF form. Now let us check its price. Those two software are developed by VeryPDF software company. If you need to more software about file format conversion, please visit its official website. If you have further question about these software, please contact us by the ways supported on this website. How to extract PDF fields from a filled out form? This entry was posted in PDF Form Filler and tagged fill PDF form. Bookmark the permalink.